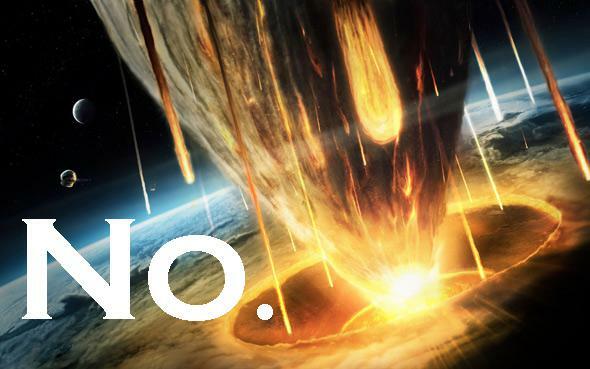 Asteroid Apophis will not hit Earth in 2036. We are safe from an Apophilypse. Wait, what? People are still fearmongering about Apophis? Seriously? OK, let’s start this off with the conclusion: Like the title says, the asteroid Apophis is not going to hit us in 2036. In fact, the cumulative chance it will hit us in the next century is less than 1 in 100,000. In other words, we’re safe. This latest doom crying nonsense to abuse astronomy comes to us from Sputnik News. * It got picked up at various other places, including Christian Today and that bastion of peer-reviewed science, Facebook. Apophis will approach Earth at a distance of 37,000-38,000 kilometers on April 13, 2029. This is true. Apophis was discovered in 2004, and after a few observations it was determined that it would make a very close approach to Earth in 2029, even closer to us than orbiting geosynchronous satellites! Still, the chance of an impact was small, and as more observations were made it became clear it would definitely miss us on that date. However, shortly thereafter things got sticky. It was discovered that while it would miss us in 2029, it will pass so close to Earth that our planet’s gravity would strongly affect the asteroid’s orbit. The closer it got to us, the more its path would be warped. And if it passed at just the right distance, its trajectory would be changed by just the right amount to bring it back to Earth in 2036 … and possibly impact us. Yeah, that’s a problem. Apophis is about 325 meters across, and so massive that were it to hit, it would release the energy equivalent to more than 1 billion tons of TNT exploding, at least 20 times more than the largest nuke ever detonated! So that is something we’d rather not see happen. But would it? The exact path of the 2029 pass is critical for the 2036 collision. In the earlier encounter, the asteroid would have to pass through a very narrow volume of space near the Earth called a “keyhole”; if it got too close to Earth, then its orbit would change so much it would miss in 2036, and if it didn’t get close enough then again, the change in its orbit would guarantee a miss. But if it got it just right, drilled right through the keyhole, then seven years later: bang. The question then became, will it miss the keyhole, or are we in serious trouble? The more observations of an asteroid we make, the better we can determine its orbit. As more astronomers watched Apophis, the chance of an impact dwindled; over time it became clear it was unlikely to pass through the keyhole in 2029, so a 2036 impact was unlikely as well. Then, in 2013, we got great news: Radar observations, which are extremely accurate, ruled out a keyhole shot in 2029. That means that in 2036, Apophis will miss us by more than 20 million kilometers (50 times the distance of the Moon). We’re completely safe*. So why then is Sputnik News reporting we might get it in 2036? Russian astronomers have predicted that asteroid Apophis may strike Earth on April 13, 2036 [emphasis mine]. What is it? “May” or the implied “will” in the headline? Sigh. The Christian Today article is even worse. The headline there is, “Giant Asteroid Could Hit and Destroy Earth on April 13, 2036, Russian, U.S. Scientists Warn”. Um, no. Even though an Apophis impact would be really bad, it would be far smaller than, say, the one that wiped out the dinosaurs, and note that the Earth is still here. “There is a chance in 2036 [that Apophis will hit Earth],” Donald Yeomans, head of NASA’s Near-Earth Object Program Office, recently told LiveScience.com. 99942 Apophis has no chance of hitting Earth in 2036 and that has been the case since at least early 2014. I think I’ve been misquoted - if indeed I talked to these folks at all. I could not have talked to them recently since I’ve been semi retired since January of 2015 and have not been the Manager of NASA’s Near-Earth Object Program Office since then. Heh. So maybe he said something like this back before 2013, when there was still a very small chance of a 2036 impact, but a quick Web search by the article author would reveal it’s no longer the case. So that article stretches the word “recently” past the breaking point. Update, Jan. 5, 2015, at 14:00 UTC: That interview Don gave was to LiveScience and was from 2011, long before the new radar observations, as I had surmised. Thanks to Peter Thomas for pointing that out. Not surprisingly, I got emails and tweets about this from people who were curious and/or frightened about this news. So let me reiterate what I’ve said so many times before: When it comes to asteroid impacts, do not trust the non-science media. ** Not because of any conspiracy or anything like that; it’s simply because the vast majority don’t have the scientific expertise to correctly evaluate this sort of news. There used to be good science coverage in American news, but most agencies have cut back on their science reporting in recent years. Couple that with rampant click-baitery, and the result is nonsense like this story. And the one before it. And before that. And before that, and before that, and before that. And and and. If it’s space or astronomy news, go to a good news source. This very blog, for example, or Universe Today; or you can follow real astronomers on Twitter. Or, y’know, NASA. If there really is a chance of an actual asteroid impact, then you can be sure we’ll be talking about it. And best yet, we’ll be talking about it rationally, realistically, and scientifically. * Correction, Jan. 5, 2015, at 14:00 UTC: I had included a radar observation of an asteroid that I identified as Apophis, but it was actually an asteroid called 2007 PA8. To avoid any further confusion I simply removed it. **Have you ever noticed how “non-science” and “nonsense” sound so similar? Huh.